Signed S.A. Rohwer, Acting Chief, Bureau of Entomology and Plant Quarantine. la and plant products to that country. 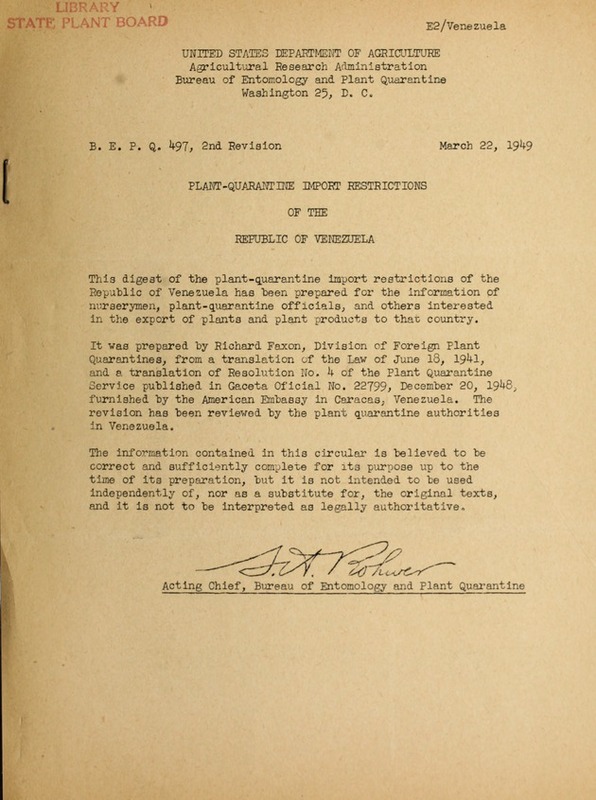 Bureu~ofEntmoloyad Plant Quar'antine Wsington 25, D. C.
plant products, to establish ports of entry, and to reqtment, quarantine, or destruction of infested products. c ing, roots, buds, branches, sprouts, leaves, fruits, etc. S i a 4 .
the p lantin par't itQi esrdtimo. arrive tn the country properly legalizdb h eeulnCnu in the country of' origin~. u r n i e S r ic r h r e i iiiiiiiiii ithe enforcement of this reaolution.